The first phase of the Dry Lake Motocross Park plan, shown above, includes facilities for intermediate riders and families. GYPSUM — The most recent open space deal being contemplated by Eagle County — the Dry Lake parcel — is significantly different from acquisitions that have been made to date. While a large section of the land will be preserved as undisturbed open space, the proposal also calls for 157 acres of the 275-acre parcel to be developed as a motocross park. The Dry Lake proposal features a partnership between the county and the town of Gypsum. The $700,000 purchase price will include $650,000 from the county’s open space fund and $50,000 from the town. The property, which belongs to former resident Ron Pirnie, is under contract through December of this year. Shroll said the Dry Lake location — along Trail Gulch Road north of Gypsum’s Shooting Sports Park — provides a buffer from residential and commercial uses while still offering accessibility. Shroll noted the town and the county will develop an intergovernmental agreement to outline uses of the recreation portion of the property and the other areas will be protected under a conservation easement. The Rocky Mountain Sport Riders will maintain the track area and motocross facilities. The town and the club will maintain roads within the parcel and any new access road into the park. Improvements are planned for Trail Gulch Road leading to the park, which will be completed by all three entities. The park itself will be open from dawn to dusk from May 1 to Sept. 30 annually. There will be no track lighting at the site and the winter closure will address wildlife concerns. Shroll also noted town and county officials hope that by providing a motocross facility, riders will choose to use the dedicated recreational amenity instead of riding in the backcountry. “We hope will be cutting down on the rogue trails around Eagle County,” Shroll said. He noted the nearby gun range is a great model for the new amenity. By providing a place to shoot, along with developed facilities, Gypsum has seen a decrease in the number of people to go to the backcountry to sight in rifles or recreationally shoot guns. “The Rocky Mountain Sports Riders goal is to have a family friendly place to ride,” he said. In its portion of the Dry Lake application, the Rocky Mountain Sport Riders notes the organization was founded in 1996 and has 344 members. The club describes itself as a family oriented motorcycle group dedicated to preserving and expanding riding opportunities in Colorado. The club noted that there are currently no motocross facilities along Interstate 70 between Denver and Grand Junction, so families currently must travel 80 miles or more to ride on public, accessible motocross track. The first phase of the Dry Lake project includes an intermediate track, a peewee track for small riders and a perimeter single-track loop. The goal for the first phase is to provide facilities for the average rider and families. The goal is to begin construction in 2017 with completion in 2018. The second phase includes an expert track and additional parking, to be completed in 2019. The final two phases include a mini track for riders as they advance from the peewee track, a pit area, an enduro cross track and possibly a trials trailing area. News headlines on Oct. 15 reported how three structures north of Gypsum were a complete loss after an arson fire during the early morning hours. That fire is not related to the Dry Lake proposal, but it did happen at the area where the motocross park is planned. “We had just gotten comfortable with the building remaining there and not removing them,” Shroll said. 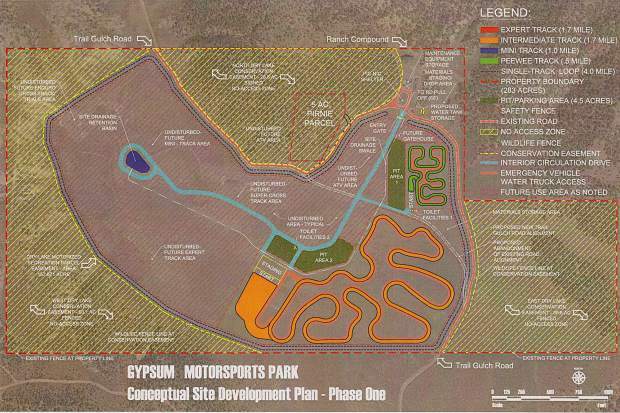 But the buildings’ loss will not have a detrimental effect on the motocross park plan. In its comments, the Rocky Mountain Sport Riders noted that many of it members work as contractors in the construction and earth-moving fields and in-kind donations of time and equipment will help with finish facilities and maintain the track and roads to the facility. The club believes the town and county investment in the project will be paid back as the park becomes more popular and families from the surrounding areas travel to Gypsum to visit the facility, spending money while they are here.